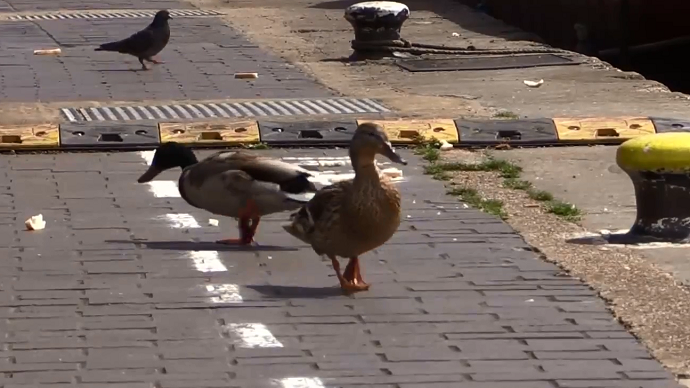 The UK has been creative with a #sharethespace campaign, which designate special duck lanes on busy towpaths in London, Birmingham and Manchester to remind people to share public spaces with wildlife. When strolling or biking down a busy canal path, British citizens might now find that they have to yield to the local duck population. River and Canal Trust kickstarted the ‘Share the Space, Drop your Pace’ campaign with the chief aim of stressing a lack of space on the UK’s towpaths. The duck lanes are only temporary, but they encourage people to remain considerate of everyone who uses the canal paths, including the wildlife. “We painted duck lanes on the towpaths just to highlight the space. Just to highlight the fact that there is only so much space that you can share. There is only so much you can do and actually probably ducks need it,” River and Canal Trust spokesperson told RT’s Ruptly agency. The Canal & River Trust is a charity that has been entrusted with the care of some 2,000 miles of waterways in England and Wales.